Call sheet protocols vary depending on the scale and type of production (documentary, narrative, still, commercial, live etc.). In this article we outline how call sheets are approved on features and television projects. During pre-production, create an episode one liner, episode schedule and a shooting schedule. These documents are usually generated with StudioBinder or Movie Magic by the 2nd AD while in prep, and include all the scenes to be shot and special instructions for all departments. Distribute the episode one liner, episode schedule and shooting schedule to key departments. The Extras breakdown is then created by 1st AD and transcribed into the call sheet by the 2nd AD. Also include two (2) days of the advance schedule from the one liner. Prelim call times are added to the two page call sheet (talent on front / crew on back). Meal penalties and crews’ hours (10hr/12hr/14hr) should be considered to avoid OT and extra charges. The 2nd AD will make a sketch of actor call times for 1st AD to approve. Breaking down scenes into characters and shoot times will help identify which talent should report to H/MU at what time. 1st AD will review the 2nd AD’s proposed call times and then modify as needed. All distributed information is transcribed by the 2nd at discretion of the 1st AD. StudioBinder helps facilitate call sheet approvals in a seamless and efficient way. Once the call sheet is finalized by the AD department, the call sheet for the next day will be distributed to the PM, LP and Director at 9-10a the day before shoot to provide enough time for review/approval. Feedback returns from the production unit and others (Director, DP). Once all have weighed-in the final details, the day can be ‘locked’ and approved for distribution. This process in television often includes actual signatures from the above stated positions on the call sheet as proof of approval. The final approved call sheet is then distributed by the 2nd AD via email and physical handouts to crew on-set. Often overlooked by novice filmmakers. It is imperative the production unit follows up with all cast and crew to ensure the call sheet was received. The production schedule could be totally jeopardized should cast or crew member not show up to set on time. Generally the production unit emails, texts, and calls every recipient of the call sheet to ensure receipt. Alternatively, film and TV production management software like StudioBinder streamlines this process by automatically tracking when a call sheet is viewed and confirmed by a recipient. That way you only follow up with those you should (and avoid bugging those you shouldn’t). We live in a digital era, so using online software like StudioBinder make everyone’s life easier. With StudioBinder, you can create and share a call sheet with “collaborators” such as your production team or clients. Collaborators view the prelim call sheet, add comments, and approve it. No need to email, print, sign off, scan, etc. Approvals are timestamped online for clear record-keeping. Best of all, StudioBinder is free to get started. 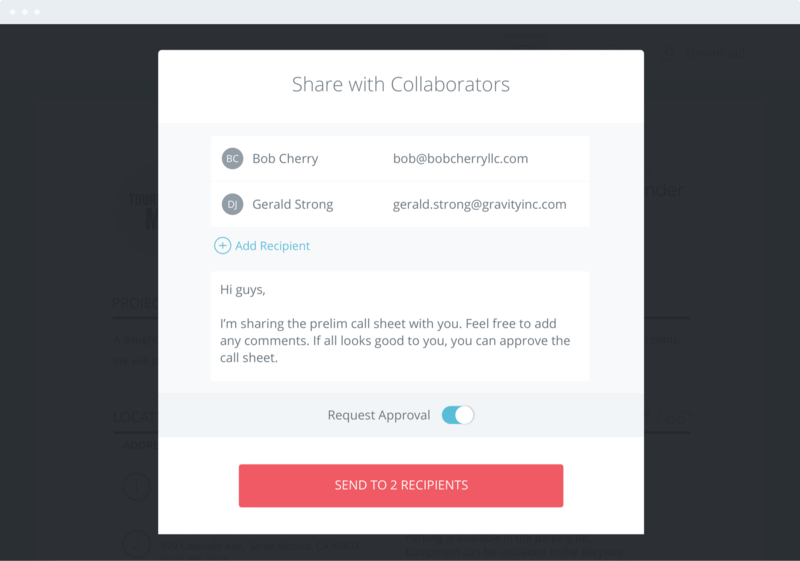 Learn more about StudioBinder’s call sheet approval system. Understanding the protocols of professional productions, and what to watch out for can help you avoid common mistakes as you define your own process for getting the job done. We know creating, sending and confirming call sheets can be a time consuming process which is why we built StudioBinder. Create and send personalized call sheets easier. Track views and RSVPs instantly. Call sheet spreadsheets are so 20th century. Create call sheets online. Send via email or text message. Track the views and RSVP's in a snap.